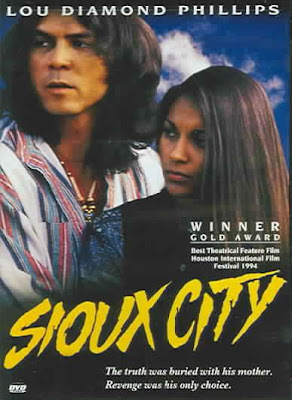 One of my late night movie rentals yielded this: vintage Lou Diamond Phillips and Salli Richardson circa 1994. There's no way I could pass that up! Not only does Lou Diamond Phillips star in the film he also directs it and sings on the soundtrack with his band The Pipefitters. When did he get a band? Seriously, the '90s went by way too fast. Anyhow, if you can get pass the cheesy musical score then you might enjoy this film. He had a band? Does Lou Diamond Phillips actually sing? And was that HIS voice in "La Bamba"? Now that's a movie I absolutely LOVE. "Ritcchiiiieeeeeeeeeeeeeee!" Nice I have been racking up my Native film collection and got this from Amazon - haven't revisited it in years :). Didn't know he had a band though . . . cool. Lou Diamond Phillips was on Broadway too, in The King and I. As far as I can tell (via the IMDb page) is that Los Lobos sang the movie version of La Bamba.